This spring has been intense, seemingly more so than others, but maybe that is just a matter of forgetfulness. As you may have noticed I’ve not posted in a while. There are many reasons for this, mostly I was overcome with writing our 3rd book, an obnoxious computer virus and tendonitis. Perhaps most of all I was reconnecting with my family after being on the road to promote HBin5. Nothing devastating, but when added up, it felt overwhelming. This is all to say that I miss spending time on Zoebakes. This is my playground, my sanctuary and where I come to recharge my creative juices. While I have been absent I have received emails and comments from some of you and I can’t express how much that meant to me. I put my heart into this website and it is an absolute joy to know you are enjoying the desserts. THANK YOU! The gift of spring every year in my garden is the rhubarb. I didn’t plant it, I don’t care for it, but every spring it pops up and provides me with such a thrill. As soon as the stalks are thick enough to hold the weight of their leaves I start to pluck them out of the ground. I really should wait, but those first tender stalks are the best of the year and I can’t resist. They usually just get dipped in sugar and eaten as is. Now the rhubarb leaves are enormous and starting to take over, the stalks are heartier, but still tender and ready for baking. Strawberry rhubarb crisp, in fact, with Fresh Strawberry ice cream. I wish I could say that the strawberries came from my garden as well, but the squirrels did those in a few years ago and I haven’t planted new ones. Maybe this year! The flat of strawberries I bought at the store were excellent, it bodes well for the season. Bright in color, sweet and firm. My husband’s all time favorite ice cream is strawberry and I’ve been trying to make the perfect batch. I think this one is the closest. It has to have intense flavor, but not be icy or grainy from too much fruit. The technique I use for making sorbet, mixed with an ice cream base I adapted from David Lebovitz’s The Perfect Scoop turned out to be the key. Combine the flour, oats, brown sugar, spices and zest in a bowl. Add the melted butter and toss until it is all well combined. Set aside. Preheat oven to 350 degrees and gather ten 4-ounce Ramekins or a 8-Inch Square Baking Dish. 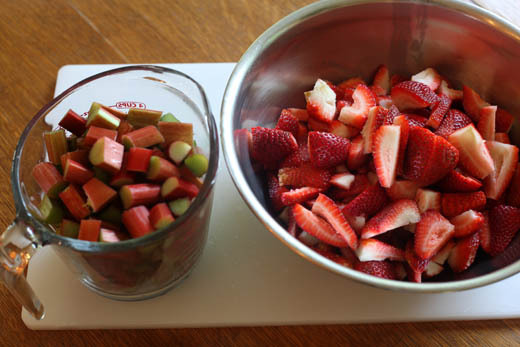 Chop the rhubarb and strawberries. In a medium sized sauce pan bring the sugar, water and zest to a simmer. Allow to cook until the sugar is completely disolved. 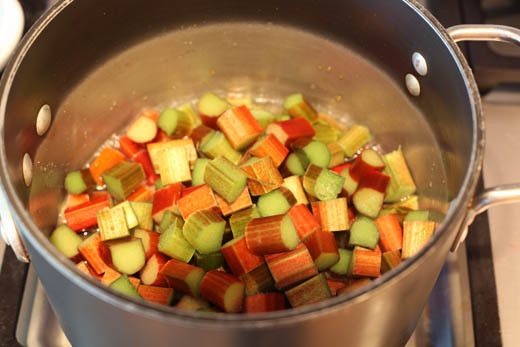 Add the rhubarb and simmer for about 5 minutes, stirring on occasion so that it cooks evenly. 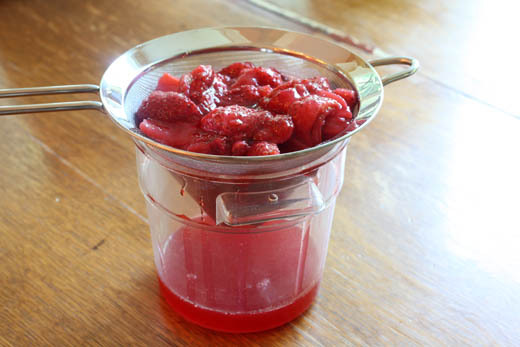 You want to soften the rhubarb, allow it to release its juices, but not turn to mush. Remove from the heat and toss in the strawberries. We want them to give up their juices too, but not get too mushy. The residual heat of the rhubarb is enough to get the job done. Allow to cool. Mix together the cornstarch and 1/4 cup sugar in a small bowl. 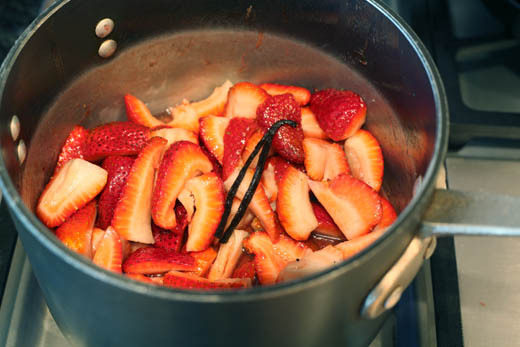 Once the rhubarb-strawberry mixture is cooled add the cornstarch mixture to the fruit, which will make it milky looking. 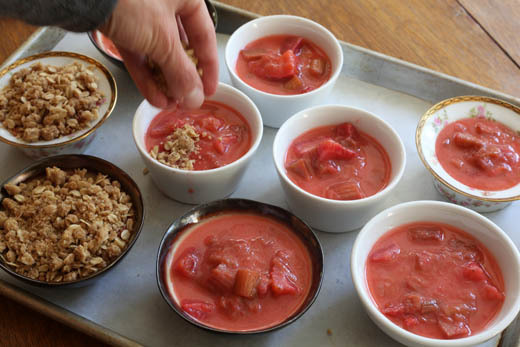 Divide the fruit mixture between the cups and top with the streusel. Bake for about 20 minutes or until it is bubbling and the juice is transparent again, this means the cornstarch is properly cooked. The trick to getting a smooth ice cream that doesn’t have big chunks of rock hard frozen strawberries, is to cook the strawberries slightly first! 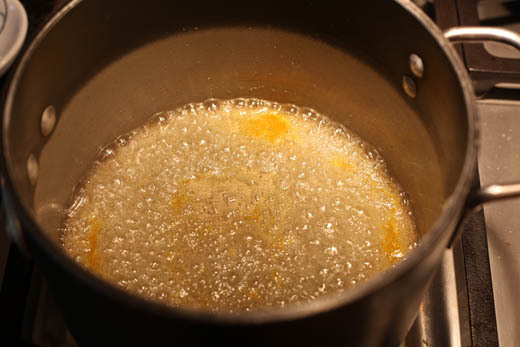 Cook the water, sugar and vanilla bean until the sugar is completely disolved. 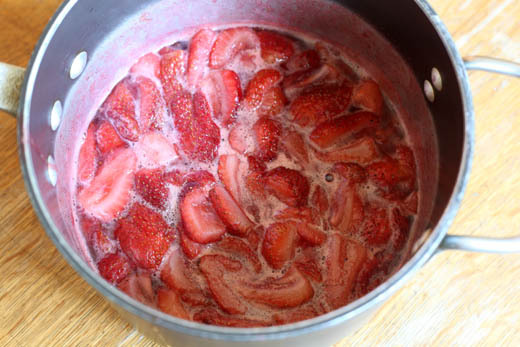 Add the strawberries and simmer on low for 5 minutes. The strawberries will still be whole, but wilted after releasing their juices. Allow them to cool and refrigerate before using them. Prepare the ice cream base at least several hours before using, but preferably the day before to allow it to set up properly. Prepare an ice bath to cool your ice cream custard. 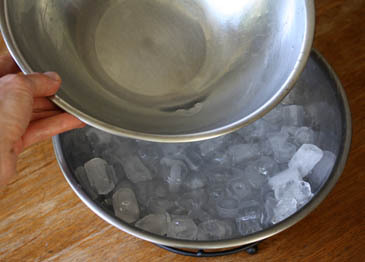 Place ice in a large bowl, fill that bowl 1/2 way with cold water. Place another bowl into the ice water. Make sure the bowl is big enough to hold all of the ice cream custard. In a medium sauce pan gently heat the half & half, sugar and salt. Place your yolks in a medium sized bowl and whisk so they are smooth. While whisking, slowly drizzle a cup of the hot cream over the yolks. When the yolks feel warm add them back to the pot of cream and cook on low heat, just until the mixture thickens enough to coat the back of your spoon. Immediately remove from heat. Cool the custard in the ice bath until well chilled. Transfer to a lidded container and refrigerate for at least 2 hours, but overnight is even better to achieve the smoothest texture. Once you are ready to make the ice cream strain the strawberries. Use a Hand Blender to chop them up. 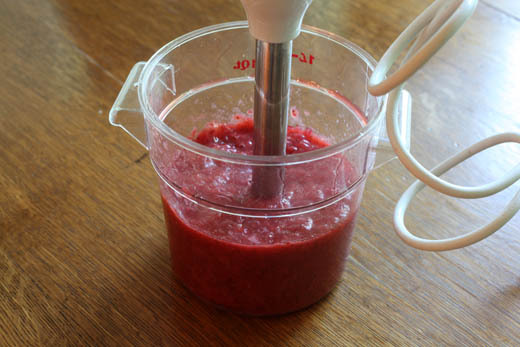 I like to keep some chunks of strawberry, but you may prefer to puree it. Stir the strawberries into your ice cream base and freeze according the Ice Cream Maker instructions. The ice cream should be set up, but still soft like ice cream from Dairy Queen. In other words don’t let it spin so long that it is hard enough to scoop. If you let it go that far it may get grainy and a little bit greasy tasting. Transfer it to a container that you have chilled in the freezer. Freeze the ice cream for a couple of hours. This may seem like a long time to wait, but the texture of the ice cream you get will be so worth it! 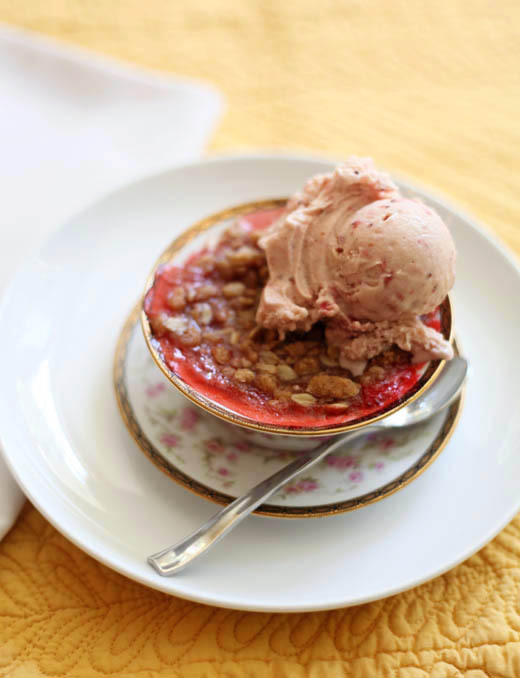 Put the ice cream on the warm Strawberry-Rhubarb crisp and it will make you happy! My husband/IT guru/web designer has redone my website and I love it. I hope you do too! I was sold on the strawberry ice cream! Looks simply fantastic. I love strawberry ice cream! And your rhubarb crisp looks wonderful.I can hardly wait to try them both. Sounds so good, I have Rhubarb in my garden ready to be made into this yummy crisp. 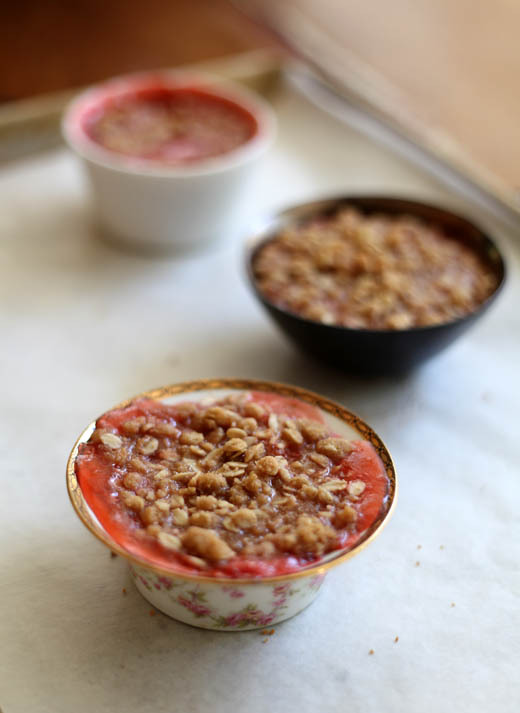 I never made Rhubarb crisp in little dishes like this. This will be something new to try. I can’t wait. i love creamy fresh strawberry ice cream. i crave it liek crazy in the summertime. perfect. A friend had given me your site for which I am very happy to have discovered…this after my sister-in-law had purchased your very interesting bread book. I’m glad that I figured the connection. Now, I’ll be able to follow your posts a little closer. Confession…I still have not baked my first bread…What am I waiting for? Yea–you’re back. I’ve missed you. 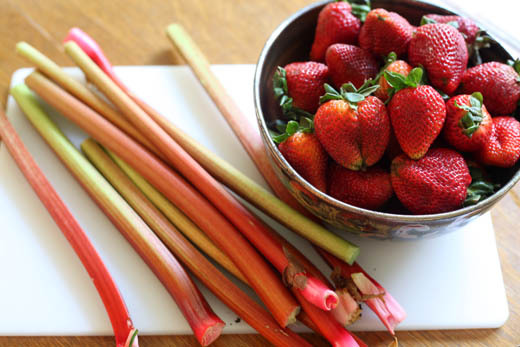 Isn’t rhubarb wonderful the way it just pops up in the spring? Your crisp looks delicious; it’s especially interesting that you “precook” the fruit before it goes into the oven. I must give it a try. Thank you so much! I precook the fruit so that the crisp doesn’t “deflate” as it is baking. Otherwise you end up with half the filling you wanted. 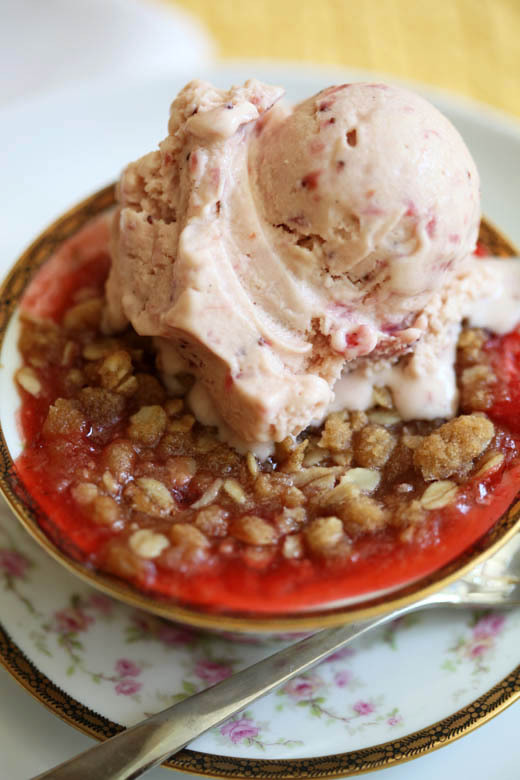 I made strawberry rhubarb crisp a couple of weeks ago and your pictures are making me want it again… I wish I had the talent to make the strawberry ice cream to go with it, but I settled for vanilla…it doesn’t get much better than a warm fruit crisp with cold ice cream! How wonderful to have some volunteer rhubarb in your garden! 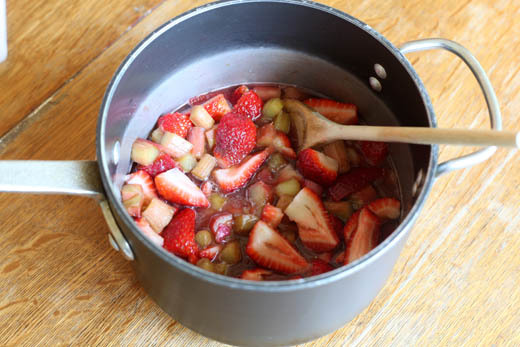 This is a lovely way to combine the classic flavors of rhubarb and strawberry. So nice to read yet another post Zoe..have been looking forward to reading your posts,and waiting for it! You’re back…I’m so glad! 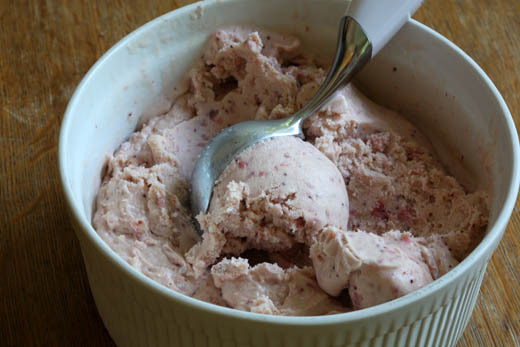 This strawberry ice cream recipe was worth the wait, I’m thinking…can’t wait to try it. Looks Delicious! Now I know what to make with my rhubarb. If it’s David Leibovitz’s recipe, I made that last summer with the chocolate mint that took over my backyard, and it was the best ice cream I ever made or had. Yummmmmmmmmm. This is so much easier than making a pie, and just as delicious – especially with that dynamite ice cream on top. Yum yum yum!!!!!!!!! I dont think it gets any better than this!!! I made the crisp this weekend! So tasty! I didn’t have rhubarb but had a huge flat of strawberries so I used all berry. The only issue I had was I used a baking dish so it took about 2x as long to cook. It was worth the extra time 🙂 yummy! So glad you tried it and enjoyed the strawberry crisp! I will add the extra baking time to the larger baking dish to the post, thanks! Oh this is simply the perfect dessert for a summer day! What a pity though I have the most difficult time here in Texas finding Rhubarb. I miss those days living in Shelburne Vermont we had our own little farm with almost any fruit you wanted. I will have to search and see if I can find it from a local farmer, as this is on my must try list! Crazy-Good Chocolate Brownies with Mint Ice Cream! (A Giveaway from King Arthur Flour!) WINNERS PICKED!